Family and friends gathered for a special meal—that’s often an image the word “holiday” conjures. When preparing for guests, you may have trimmed the tree, put out the wreaths, and added some twinkly lights, but don’t forget about your table. People wait all year for turkey and sides so your table setting should match the important occasion. This doesn’t have to be expensive or difficult. There are so many table items from a variety of retailers so you can find the right pieces at the right price. Here are some tips for setting the perfect holiday table. Start by choosing your color palette. Online resources like Pinterest or design-seeds.com can give you color ideas based on moods or seasons so you can decide on your dominant theme. Pick two or three main colors so you don’t overwhelm the table or feel like matching your plates, to your glasses, to your napkins is an impossible task. By choosing a limited palette and accenting it with neutrals, you can create an elegant table that pops and is also easy to recreate or revamp year after year. While it might be tempting to have special holiday items you only use once or twice a year, when it comes to storing these pieces you might find you don't have the space. You can create a beautiful table by incorporating some of your everyday things with special pieces. Pair festive chargers with your normal dishes, especially if they are neutral in color and style. Put out special holiday wine glasses with your normal water glasses. 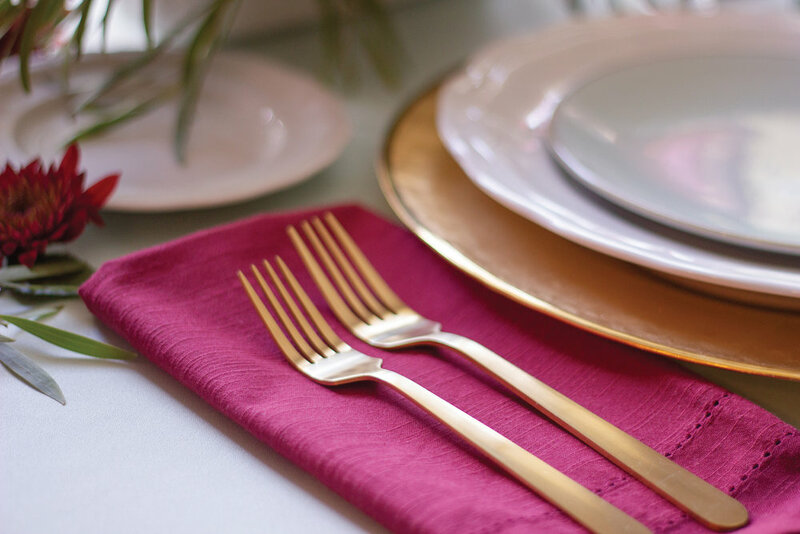 Flatware is another great way to incorporate a little sparkle and, since forks and knives don't take up much space, investing in a holiday set will help you design a beautiful table for years to come. Try to find a set that’s dishwasher safe. The last thing you’ll want to do is hand wash your flatware! Consider adding a beautiful floral arrangement. Flowers bring in color, and are an easy way to create a more festive setting. A local florist can match any color palette you choose but you can also create the arrangement yourself. Local grocery stores, especially specialty stores, stock fresh flowers year-round and have seasonal varieties for the holidays. Again, choosing a dominant color or two and then accenting with neutrals and greenery keeps everything simple and elegant. It’s also a good idea to choose flowers that are appropriate for the season. Popular flowers to include around the holidays are roses, chrysanthemums, alstroemeria, and white calcynia. Mix in eucalyptus, dusty miller, holly, pine cones, pine branches, and red or white berries to fill open areas. Always keep your arrangements low so you don’t disrupt sight lines and conversations around the table. Now that you’ve selected your items, it’s time to set the table. Place the salad and dinner fork to the left of the plate with the smaller salad fork farthest away from the dinner plate. Knife and spoon go on the right side and place the knife directly next to the plate facing in and the spoon next to the knife. Napkins can go under your forks or can be attractively folded on top of your dinner plate. Glasses should be arranged above the knife and spoon while the bread plate is placed above and slightly to the left of the forks. Once all the pieces are in place, that’s it, your holiday table is ready for an occasion of delicious food and fond memories.